(b. 1949) – Orientalist, translator, author of numerous research papers, Jagiellonian University professor. The Head of Iranian Studies at the Institute of Oriental Studies of the Jagiellonian University; a member of Societas Iranologica Europaea, Orientalist Commssion and the Committee of Orienitalist Studies at the Polish Academy of Sciences. She carries out research in the area of Persian literature and culture of the Iranian world. 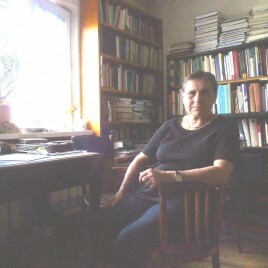 She authored, among other things, Historia Iranu (Wrocław 2010); editor of the volume Irańskie drogi do nowoczesności. Projekty. Idee. Manifesty (Kraków 2014). Her Translations from Persian include Ferdowsi’s Księga Królewska(The Book of Kings) and Shahrnush Parsipur’s Tuba i znaczenie nocy(Touba and the Meaning of Night). Lives in Kraków.